Always treading new paths, creative with every step, Jaybo, a Frenchman who lives in Berlin, is on a constant journey. With his store of memories he explores the world and draws an emotional topography of his life, consisting of half hidden visual fragments of memory that are revealing and timeless at the same time. He is an artist at art’s end, where everything has already been painted, where all words have already been spoken, where the viral conduits of the internet merely fulfil the purpose of mediocrity, in which the imitator copies the replicator who copies the imitator and where, at each stage, some of the quality is sacrificed. Jaybo leaves the world of rules behind; he revolts against every form of this intoxication of imitation, rebels against all forms of institution and existing order. The artist follows paradoxical ideas, born of the legacy of Romanticism, ideas on the edge of insanity, orientated on childhood, nature, places of not-thinking. The result is a dance between the rational and irrational. Jaybo is a dis-organiser who acts as a craftsman of serendipity with the aim of freeing art from the artists’ enclave. He fights passionately against symmetry, in order to avoid the ugliness of perfection. Every example of his work can be taken as a sum total in itself, but opening itself up to the viewer’s own associations in its details. 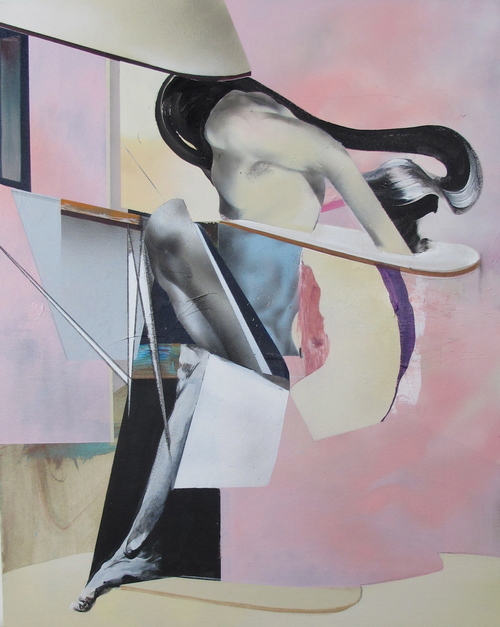 Jaybo deconstructs our memories of the body and ideals of beauty. He deconstructs the story in a catalogue of half-memories that can be read, but not explained. Jaybo demands independent visual decisions of the viewer instead of allowing the option of an open ending: he is not interested in creating images that illustrate and define, wanting instead to show vantage points that stimulate us to question and force us to make decisions. The life of forms in itself suffices, so as to avoid the circumlocution of the narration, because fine art is, of necessity, a fiction of its own reality. Jaybo’s images are visual haiku, visual acupuncture. Needles for the soul, filled simultaneously with nonsense and realism in the vacuum of ambiguity. In “Running with the Hunted” the ambiguity of the hunted is revealed, somewhere between desire and hate. The artist is fleeing from any form of expectation: he wants to work disengaged from the gravitational pull of society. Jaybo is co-founder of the culture and fashion magazine “Style and the Family Tunes” and the fashion label “Iriedaily”. Since 2009 he has been showing his work regularly in international galleries. The artist has had solo exhibitions in Los Angeles, New York, London, Paris, Berlin, Goldcoast and Perth . Jaybo’s work has its roots in street art, but nowadays is attributed more to the world of fine art. Jaybo (*1963 South of France) lives and works in Berlin. Wenn Sie Fragen zum Urheberrecht, Marken- oder Designrecht haben und rechtsanwaltliche Beratung benötigen, können Sie mich gerne kontaktieren.